Double-LP released 1985, Wergo Schallplatten Gmbh. 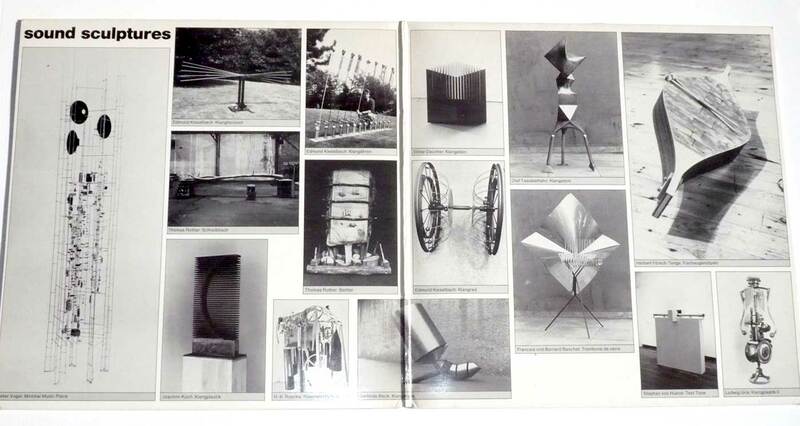 Published by Wergo in 1985, Sound Sculptures is a gorgeous, state-of-the-art overview of Austria and West Germany’s instrument builders and sculptors curated by composer and music critic Klaus Hinrich Stahmer. A German equivalent to Bart Hopkins’ Experimental Musical Instruments compilation CDs, though the concept here being that composers/interprets will use someone else’s sculpture or sound construction to create their soundwork. The title’s double-entendre is perfectly maintained throughout the album: sound producing actual sculptures and soundcrafting as an artform. Particularly striking is the variety of sonorities emited, from angklung-like metallophones to interactive electronic sensors, from industrial bleak soundscapes to subtle microtonal nuances, from improvised free music to drone-a-thon. This is rather un-classifiable music only occasionaly sounding like Stockhausen or Boulez solo percussion pieces. Apart from the sculptures, additionnal instruments include: strings, bowed metals, metal chimes, saxophone, sea shells, wood, processed vocals, voice, electronic effetcs, etc. While some composers/improvisors are instrument builders themselves, like Hans-Karsten Raecke (cf website), others are avantgarde music composers, like Greek-born Austrian Anestis Logothetis (1921-1994), whose enchanting and nuanced minimal music – one of the highlights of the set – blends electronic and acoustic sounds, and have a visual dimension often based on graphic scores (see Dmtls Merzbau’s post). Wilfried Jentzsch studied with Xenakis in Paris (1976-1981) and is now an electroacoustic music composer living in Dresden. His piece Lithophonie is based on electronically processed sounds from a stone sculpture, with a decidedly stochastic touch in its clouds of high pitched notes. Herbert Försch-Tenge‘sTri-Cello II sounds like a Zoviet-France live recording, complete with bass string instrument hit with mallet, ethnic flute and long reverb effect. Too many good tracks here to mention, but this is a major addition to the sound art pantheon that can even help widen the definition of it. Thanks to Vespucci for this masterpiece. It is wise not to resist to this monster, Margot! Bloody out-standing! Thanks a lot. Un regalo para los amantes de Sebastian Gandera / A gift for the lovers of Sebastian Gandera. HCE, thanks for your comment. And Ra: thanks for your Gandera cassette: very nice. great attempt! maybe the archives in mp3 for fast download! It’s possible a Re-up? Thanks!